THANK YOU BAE Give AsYou Earn! This wonderful cheque was given to us at the annual BAE GAYE presentation on Thursday 13 December by Oli Wignall, BAE Operations Director. 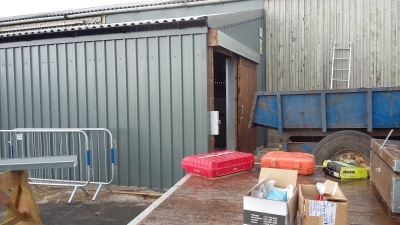 The money will be used to pay for the new safety barrier we have recently installed in our hydraulic lift building. We have received so many generous donations from BAE GAYE over the years and thank them for their continued support. What fun everyone had at our last riding session on Wednesday 5 December. Father Christmas and the naughty Elf were both there to hand out presents to our riders - many thanks to them for taking time to visit when they are so busy at this time of year! 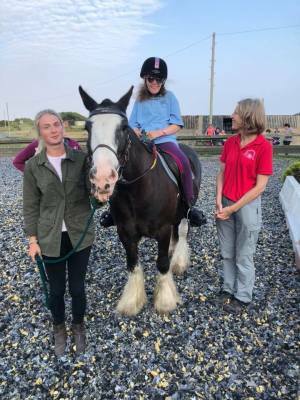 We were also delighted that Lady Cavendish, our President, and her daughter Lucy were able to join us to celebrate another successful year for Furness Group RDA. many local businesses and people supporting us with donations and help. Merry Christmas and Happy New Year to them all. Now we look forward to seeing what 2019 brings. A big thank you to everyone who came along to support our coffee morning in the Coronation Hall, Ulverston. It was a busy morning and we were pleased to see some of our retired volunteers there to help or visit. Reg was lucky enough to win a knitted friend! Some of our Wednesday morning riders came along and enjoyed having a look around the stalls and having a go on the Tombola. 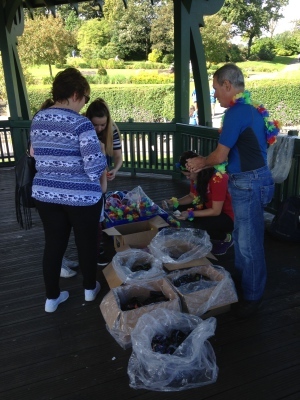 We are so lucky to have so many hard working volunteers to help run our fundraising events. We were told that the coffee was delicious and we raised £523 to help us continue to offer riding to children in the Furness area. Thank you to the K2B & C2B for their donation to our group. We run the food stop at Machells Coppice (on the east side of Coniston Water) providing the runners/walkers with food and hydration. It is a fun day and we enjoy getting into the spirit of things. There are so many worthy charities benefitting from the walk and it was good to meet some of them at the award ceremony on 8 November. We sat next to a gentleman who has done the walk 30 times and the man next to him 38 times! Quite amazing. Thank you to everyone who came to this, our main fundraiser of the year, and raised a total of £2470 for Furness RDA. Thanks to all the lovely riders who came back so happy having had a brilliant ride. Also to all our fantastic volunteers who came to man the registration, marshal the course and generally help. Thanks also to Danny Wallbank who came along as our farrier on call and to his Mum for coming to help with the registration. Also to Dave, Ian and Neil from the BAE Keswick to Barrow Walk Committee and The Furness First Aiders. Without all their enthusiastic help the ride would not be possible. And, of course, we must not forget Lord and Lady Cavendish and Lucy who so kindly let us use their beautiful estate for the day - grateful thanks to them. Photos have been posted on our Facebook page. 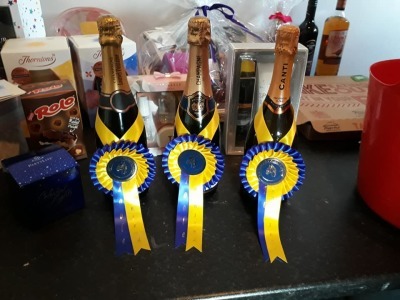 Well done to all the riders who took part in our annual gymkhana down at Seaview Riding School. 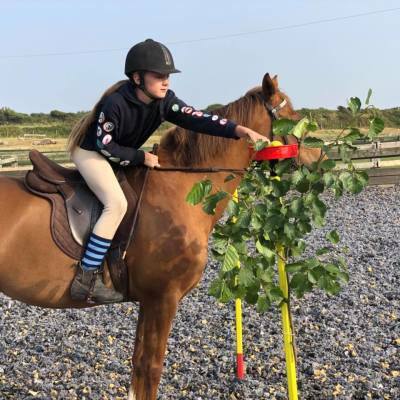 The Seaview Pony Club members and RDA riders were put into mixed teams for an enjoyable evening of friendly competition. We are proud to hold this inclusive event each year and thank Claire, Faye and staff for all their organisation - the night ran like clockwork. The Edward Trophy was presented to the winning team. 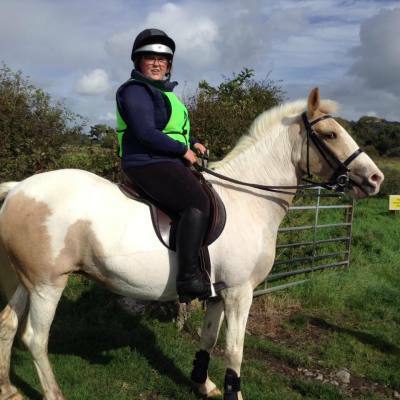 Edward is remembered by so many riders in the Furness area as he was their introduction to horses. 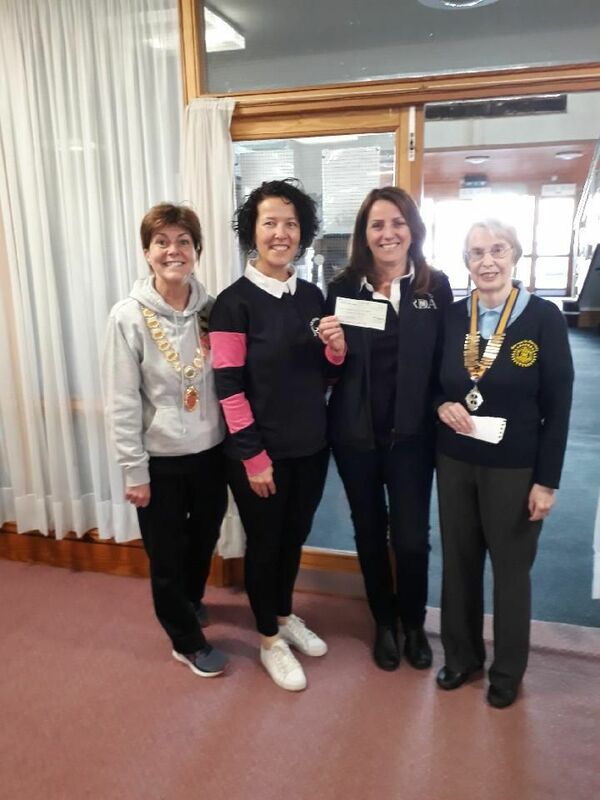 ​Another surprise on the night was when Elaine Parker, Chairman of Inner Wheel District 19, arrived with another cheque for £100 bringing the total they have given us to £1,561! Thank you to Elaine and the members. 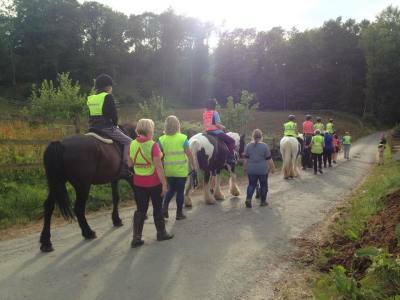 We organised 2 Away Days to Old Hall Farm for our Wednesday morning riders and an Away Evening to Witherslack Equestrian Centre for our Thursday evening riders. Fortunately the glorious weather continued for all three outings and a fun time was had by all. Thank you to all our volunteers who give up there time to make these trips possible and to the staff at both venues. Aileen and Judith were asked to represent RDA at the local "Postcodemillions" event at Hawcoat Park on Saturday 30 June where £3 million pounds was handed out to 260 lucky residents in LA14 4. 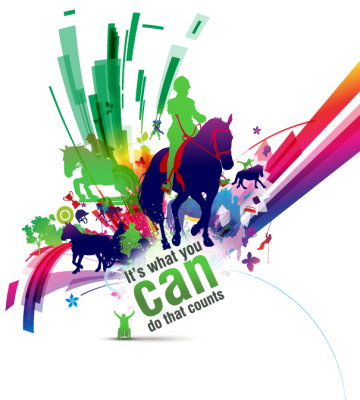 Furness RDA received a grant of £2064 from the Postcode Lottery for safety equipment for our hydraulic mounting platform. Time to buy a ticket?! Inner Wheel District 19 - a huge thank you. Thank you to Elaine Parker and her team from the Inner Wheel who presented us with cheques totalling £1,361. Elaine had recently returned from a conference in Australia and obviously brought the weather back with her! 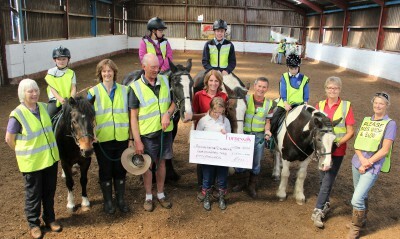 They cheques were presented at Seaview Riding School after our Wednesday morning session. Thank you to everyone who made our annual holiday to Clwyd such a huge success. The holiday was very kindly paid for by the BAE Quizzers who presented us with a cheque earlier this year (see artilce below). This year we took 5 young riders from Sandside School, Ulverston, who looked after their own ponies for the duration of the holiday. They had to catch, groom and tack up before the riding even began! - something they haven't got the opportunity to do at our normal riding sessions. We also visited nearby Chester Zoo and Pizza Hut. At the end of the holiday each rider and school staff member were presented with a lovely rosette made by Jenna Fye. We are so lucky that we have enough volunteers who are willing to give up 5 days of their time to come along and help with both riding and catering. We must also mention the school staff - they were fantastic - so competant and caring with their young riders. Thank you Elaine Parker, President of District 19, for choosing us as your Charity of the year. The Barrow branch organised a very busy and friendly coffee morning at Trinity Church, Barrow-in-Furness on Saturday 14 April from 10am - 11.30am. We were so pleased to be given such a warm welcome and to be presented with an inital cheque for £100. How lucky we are to have so much support from the local community - 2 fantastic donations in 1 week. 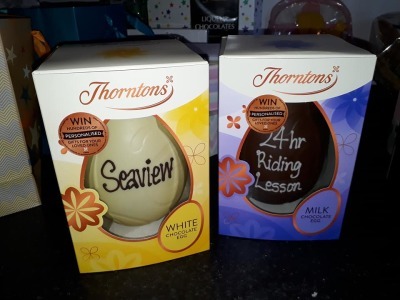 Well done Seaview - a 24 hour riding lesson - what a novel idea! 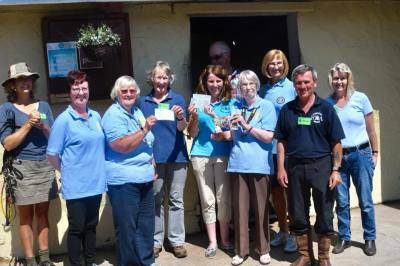 School (Furness Group's riding centre) for organising such a successful fundraiser. The sessions started at 12pm on Friday 23 March and finished at 12pm the following day. Back to back 30 minute and 1 hour lessons for approximately 60 riders who each collected sponsorship. 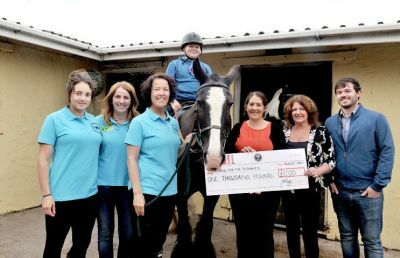 £3,500 was raised to be shared between Furness RDA and Alice's Escapes. Poole Townsend very kindly sponsored some colourful rosettes which were awarded to everyone who took part. 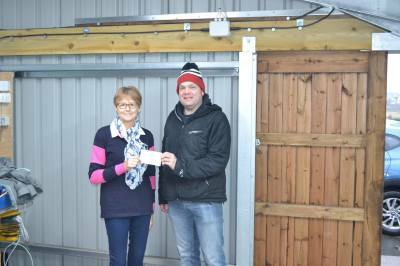 Gilmour Fabrications very kindly donated a gift voucher to Mr Wood for raising the most sponsorship - a whopping £600! We are very grateful to all the support we receive from everyone at Seaview - it really is great RDA Centre. The lift building floor is now painted and we have ordered a cupboard for the hats. This has been a long project but is very nearly completed and we hope to have an opening ceremony sometime when the weather is better! Thanks to everyone who has contributed either with finances or their time. 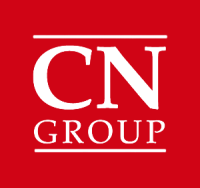 Thank you CN (Cumbria Newspapers) Group for your generous donation of £1,000. 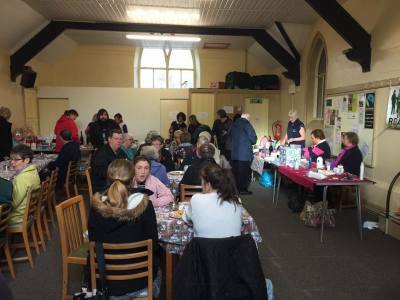 A busy and successful Coffee Morning in Nov 2017 raises £720! What a fantastic coffee morning! Many thanks to all our customers and those who supported it in any way, especially the volunteers who worked so hard to make it a success. It was lovely to see so many of our riders and their staff there and hope you enjoyed yourselves. We took just over £720 which is an incredible amount! Thank you all very much indeed. Karen Ashdown and John Rawlinson visited Seaview on Thursday 9 November 2017 to see us in action! They had raised a massive £2,335 and presented us with a very large cheque! It was lovely that they stayed to see our first session despite the very cold evening. The money will pay for our Clwyd holiday in April when we take 5 riders from Sandside to the Clwyd Special Riding Centre in Northern Wales. Thank you to everyone involved in this very kind donation. Thank you Barrow Island Singers for your very generous donation towards our riding activities. It was so interesting to hear that you visit local care homes and sing for/with the residents in return for a donation. Then when you have raised £500 you look for a local charitiy where the money will benefit the local community. Please keep up your good work and keep in touch. for your generous donation of £1,000. The cheque was presented by Jane and Hall Armstrong at our Seaview Gymkhana. We had another lovely evening at Seaview Riding School for our annual gymkhana with the weather luckily staying dry as it was not a good forecast. 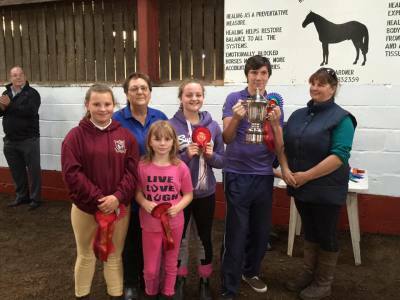 Our riders and those of Seaview Pony Club teamed up together for a friendly competition evening. It was lovely to hold such an inclusive event with the children riding in mixed teams to take part in the' Edward Cup Day'. The trophy is in memory of a very special pony, Edward, who has taught numerous children to ride over his many years at Seaview. As you can see below Reg presented the rosettes to some delighted children. 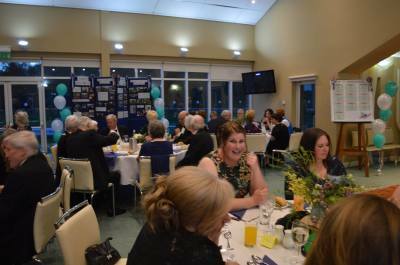 Please see our Gallery page for photographic proof of a fun evening. 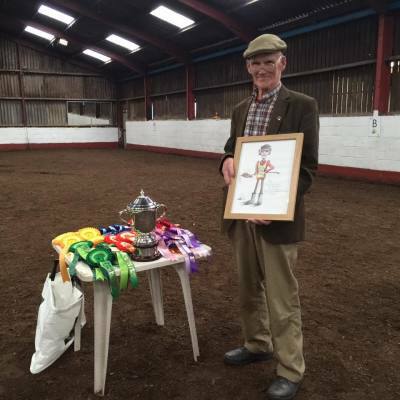 A big thank you to Reg who retired as a volunteer of Furness RDA at our gymkhana on 6th July. Reg has volunteered with our group for 12 years and we have enjoyed having him around. He has helped with all the things that run in the background at our Wednesday morning sessions (eg poo picking, setting up, coffee making etc). He is 90 in August so deserving of a rest. We do hope to see him occasionally when he can pop into have a chat and see what we are up to. He is shown here with his leaving gift, the lovely charticature kindly drawn and donated by Jack Richards. Reg then went onto to present the prizes to all the RDA and Seaveiw Pony Club riders that took part in the competition. Thank you to Old Hall Farm for making our visits so much fun. 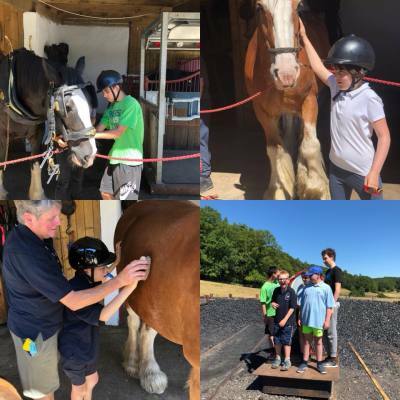 Our riders from George Hastwell, Sandside and three main stream schools enjoyed feeding all the animals and then grooming the working Clydesdale, George, before he was put into his harness to do some work. We hope to have some photos to post but this is becoming increasing difficult with the schools photographic policies. We had another brilliant holiday - this time with 5 riders from George Hastwell School, Walney Island, Barrow-in-Furness. The highlight of the holiday was having the opportunity for our riders to try out the mechanical horse in their new Therapy Centre. 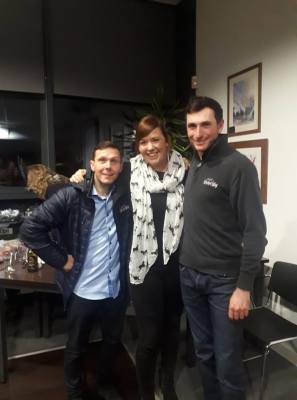 We were also lucky to have full use of the stable facilities at the Centre which was much easier than grooming and tacking up in the indoor school and a better experience for our riders. We rode both inside and out and had a teddy bear hunt with a picnic. It was lovely to see everyone having such a fun time. Thank you to our volunteers who gave us 5 days of their time and also to all our supporters/donors who all contribute to making the holiday possible. Well done Jocelyn Martin from Walney School who entered the RDA writing competition and received a certificate and rosette. Thank you Marks and Spencer Barrow Branch! Thank you to Marks and Spencer Barrow Branch for all their support during our association with them as their chosen Charity of the Year 2016/17. Pictured is Rebecca, Food Section Manager from Marks and Spencer presenting a cheque for £4,243.43 to Alison, Furness RDA fundraising officer. Marks and Spencer matched £1,500 of the money that was raised throughout the year. 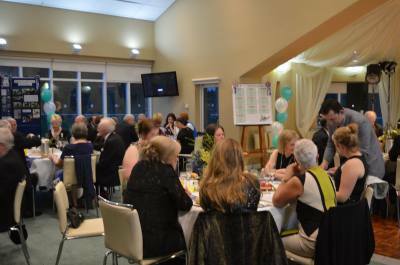 What a fabulous night we all had at our Gala Dinner held in The Grandstand at Cartmel Racecourse. Lady Cavendish kindly offered us the use of the Grandstand to hold this fundraising event. It was lovely to have our families, friends, supporters and donors there to help us celebrate the work of our group. 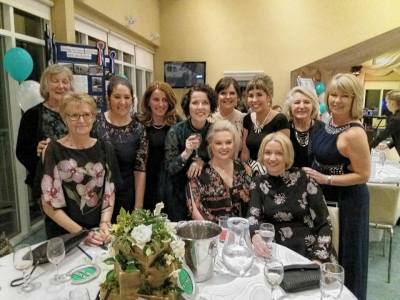 We were especially pleased to have Eileen Milligan, our Vice President and a founder member, join us on the night. There were also some other founder members present and they seemed pleased with the way the group has continued to flourish. John Sexton kindly agreed to be our Guest Speaker and Howard Whitaker came along to run the auction. As you may have seen, our lift building is now in place. The hydraulics and electrics for the lift itself are soon to be up and running. During the winter months, with all the rain we had, there were one or two leaks, but hopefully, that has now been resolved. The safety sides, which surround the lift itself, are soon to be fitted and also a safety handrail alongside the ramp leading up to the door. this will complete all external works. funding from generous donors to see it through to its completion. June and Jane went along to the Golden Ball in Dalton to collect a very generous donation of £500 from the Ladies Bingo Team. 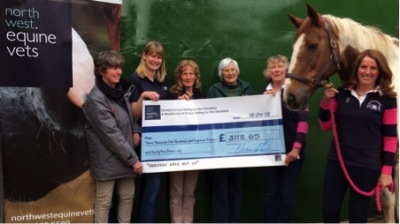 Thank you Croft Rock for your very generous donation of £500 towards our riding activities. 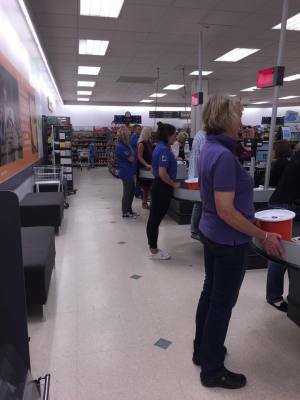 A big thank you to everyone who came along and helped out at our bag pack. 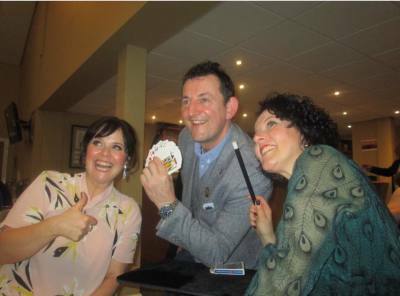 It was a huge success and raised a staggering £1163.27! Friday 31st March 2017. Thank you Marks and Spencer. 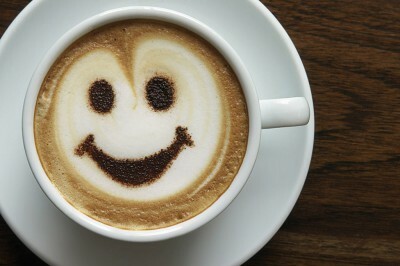 ​Well done to everyone who turned up to support our coffee morning in the Coronation Hall. Together with the entry fee, the raffle, tombola, cake stall, bric a brac stall and our own stall raised an impressive £515.02. An added bonus were the comments about the quality of our bric a brac! and the lovely cakes. 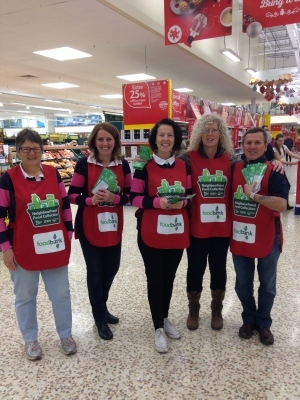 A few of our Trustees and Volunteers spent 3 hours on Wednesday evening helping with the Tesco Food Bank. We handed out leaflets and collected food from some very generous customers. It was one of the most successful collections they have had. 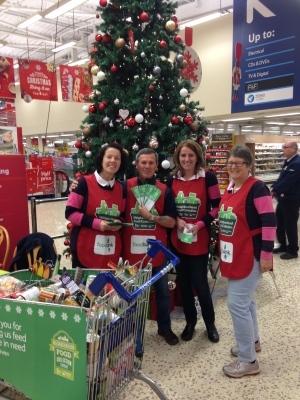 Well done everyone and Tesco - the hampers will really make a difference to some people this Christmas. We all enjoyed helping out at this coffee morning in Dalton-in-Furness. It was very well supported and we raised £213.06 and took £146.30 on our RDA stall. Thanks to Sue and Dee who organised a date for us and also to Raymond who was a wonderful help. 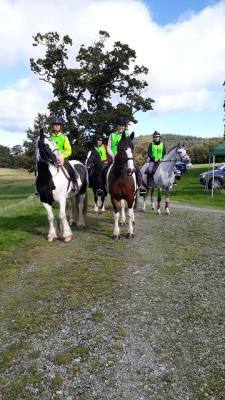 Once again we held a successful Sponsored Ride at Holker Hall and 52 riders enjoyed riding around the beautiful Holker Estate. We are very grateful to Lord and Lady Cavendish and Lucy for kindly allowing us to use their home for this, our main fundraiser of the year. Thank you to the BAE K2B team who came with their usual gazebos, tables and chairs and also helped with marshalling the course. We also had a good representation of BAE First Aiders who dotted themselves around the course in case of any incidents - they too helped with the marshalling - thank you. Rebecca, Helen and Joan from the Barrow branch of Marks & Spencer organised the raffle and donated another fantastic hamper which was won by a delighted Aileen Dixon. Thank you M&S. Joan also presented Katie Thompson with a horsey hamper and some treats for her pony Miri. Katie and Miri raised the most sponsorship for a junior rider - an impressive £115.00. 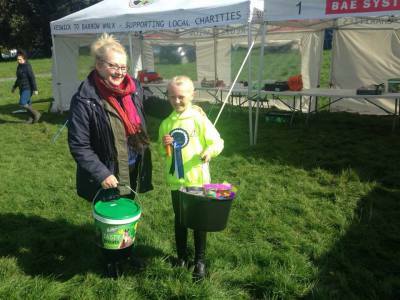 Samantha Brood was presented with a human hamper and some treats for her horse Rose. Samantha and Rose raised the most sponsorship for an adult rider - an impressive £305.00. Alexander Veterinary Centre, Barrow-in-Furness, kindly sponsored the rosettes which were expertly made by Jenna. Also thank you to all our volunteers who came to help with marshalling, registration etc. Danny was there should any of the horses loose a shoe - thank you Danny. 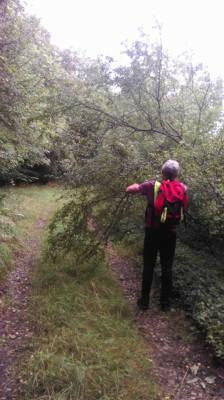 And last but not least a big thank you to Mark and Amanda Richards who spent so much time making sure the course was safe and chopping down those pesky saplings! - and also organising the entries. Without all of you we would not be able to run such a successful event. 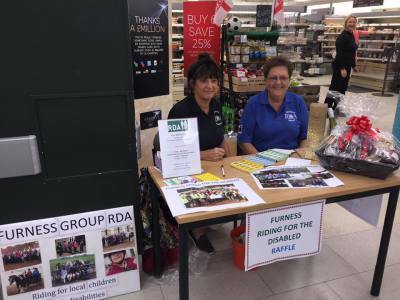 Well done to Katie and Miri who raised £115.00 for Furness RDA. 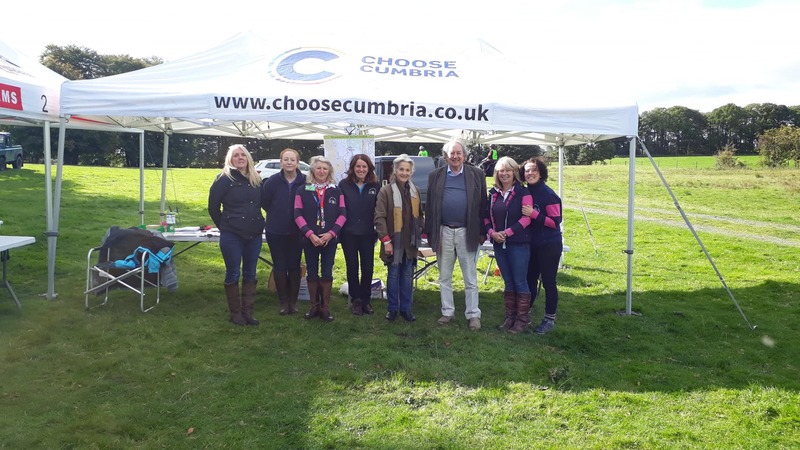 Furness RDA is one of Tesco's chosen chartities for 2016 so some of our volunteers went down to Barrow Park to help out with their Colour Splash. The weather was beautiful and everyone seemed to enjoy themselves, although it was rather messy! We would like to thank Nat and Fiona, the Community Champions from Tesco, who did a very good job of organising the event. We managed to capture this picture of a very handsome Harry! Alison, Jane and Judith went along to Ulverston Auction Mart to sell some of the bric a brac that we had stored away. It was a lovely day and we managed to raise £106.87 for our Group. Meanwhile Mark and Amanda had been out on the sponsored ride course at Holker Hall looking out for those pesky saplings! managed to sell plenty of tickets. What a lovely evening Jane and Judith had with the Ulverston Rotary Club on Monday 1 August at the Old Mill at Bardsea. They enjoyed a delicious meal and gave a talk on the work of our group. Many Rotary members asked questions afterwards and were surprised at how much we get done throughout the year. Thank you to Ulverston Rotary for making us so welcome and for their donation to our group. 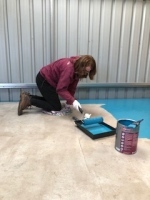 Thank you to the 5 Glaxosmithkline employees who came along the day before our Summer Gymkhana to paint the arena ready for our riders to compete in. As you can see they did a brilliant job - but can we see a little bit there that David has missed?! 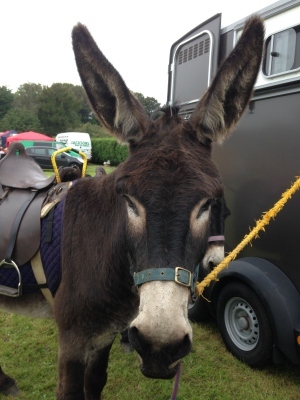 What a brilliant time everyone had at our gymkhana at Seaview Riding School on Thursday 7 July. Our RDA children were riding alongside the Seaview Pony Club members and were mixed together into 6 teams of 4 riders. 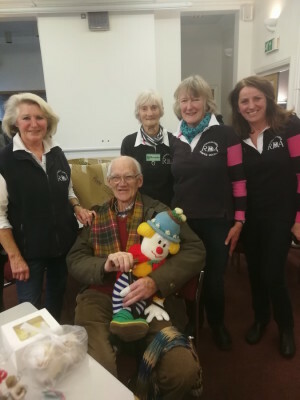 We were joined by Henri Carew, Cumbria RDA Chair, and Carole Barr, North Region RDA Chair, who were happy to lend a helping hand and eventually present Jen's beautifully made rosettes to the riders. They were both impressed with such a fun and inclusive event. We would like to thank all our helpers who turned up to assist with the numerous tasks and also Neil for bringing along the ever popular burger van. And of course a big thank you to whoever organised the fantastic weather! and raised a fantastic £1,350. sponsored. The shirts will be worn by our volunteers when fundraising for us. Thank you RUMIC. new hydraulic mounting platform. 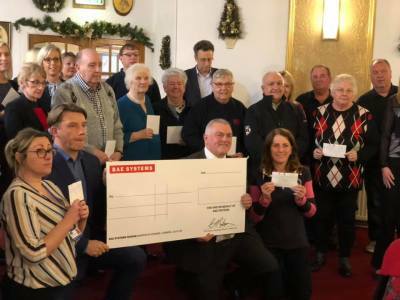 The platform was kindly donated by BAE Systems Marine and with a fantastic donation of £10,000 from the Keswick to Barrow Walk Committee we commenced work earlier this year. We are also very grateful to the Sir John Fisher Foundation for their £5,000 donation. 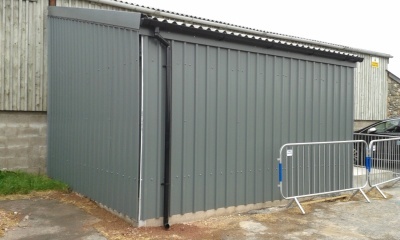 The extension is now complete and we have knocked through into the indoor arena. 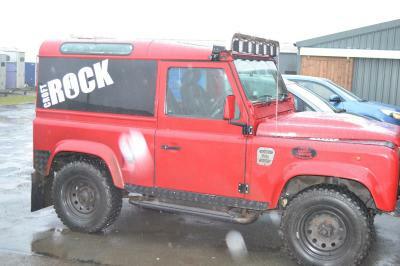 All that we need to do now need to install the lift and do the electrics. We will keep you posted. Thank you Furness Building Society for the £150 donation towards our riding activities. We had an enjoyable day at Cartmel Races. Marks & Spencer (Barrow) gave us a beautiful hamper to raffle and this was won by a delighted Alison Bolt (picutured). We raised £332 and this will be put into our M&S collection pot (see below). We also made contact with some people who are keen to help our group with riding and fundraising. Thanks to Cartmel Racecourse for inviting us along for the day. 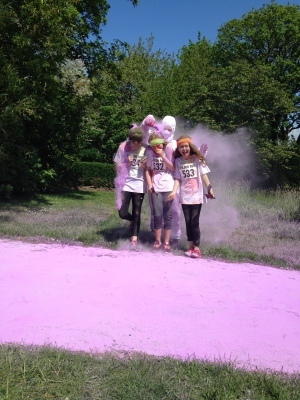 We have just heard from Nathaniel Welham, Tesco Community Champion, that the Colour Dash was a great success and the weather was perfect. The Park looked lovely with the trees all full of blossom. the grassy banks enjoying both the music and sunshine. We were delighted to recently be chosen by Marks and Spencer Barrow in Furness to be their charity of the year for 2016/17. We look forward to working with the staff to raise funds and awareness for our group. We will keep you posted about the events we organise. Thank you Marks and Spencer. 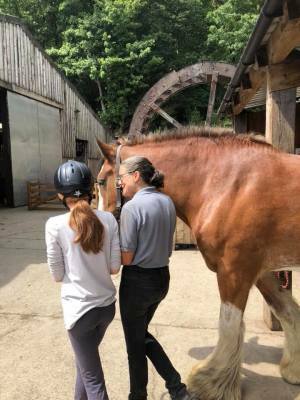 A fantastic holiday was had by all at the Witherslack Equestrian Centre. 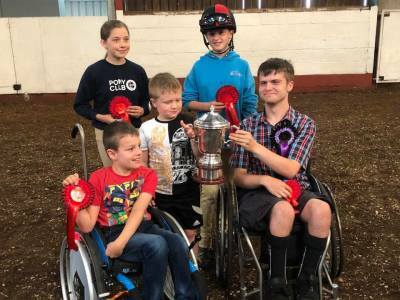 We had to change our venue at the very last minute as the Clwyd Special Riding Centre had to close because of a strangles outbreak in the area. Deana at Witherslack was so accommodating and the riders and school staff had a very comfortable stay in the old farmhouse. We rode in their arena on the Thursday afternoon and Friday morning and then had a lovely hack out on the Friday afternoon along a bridleway and through the woods. Thank you to everyone who came along to help and to Kerry, Carol and Kay (staff from Sandside School) without whom none of this would have been possible. Have a look at the photos on our Gallery page and also on Facebook. 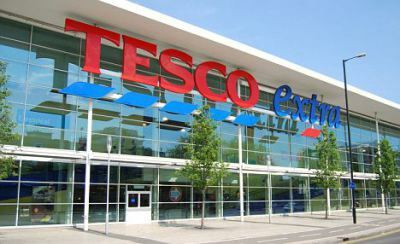 Thank you to Tesco who are selling second hand books for us to raise money for our group. We have already had over £200 from the sales. If you have any books that you no longer want could you please drop them off at the Customer Service Desk and say they are from Furness RDA. Thank you so much to BAE for all their support over the years but particularly for their support recently in helping us acheive the dream of having our very own hydraulic mounting platform. Each year when we visit the Clwyd Special Riding Centre for our annual holiday we use their hydraulic mounting platform and think how fantastic it is. It helps the riders mount more easily and this gives them so much more confidence. 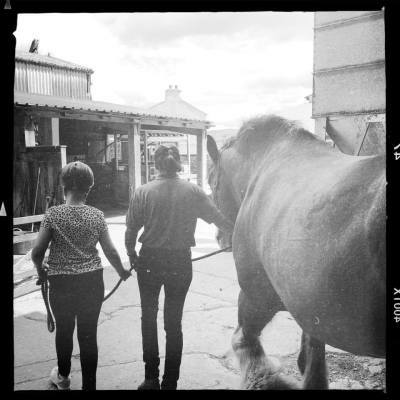 It also helps us get the riders on the ponies more quickly so they have more time in the saddle. Pictured is Craig Bland, Project Management Director at BAE Systems, presenting a cheque to Judith Stitt, Furness RDA Chair, for £10,000! We were also awarded the Gordon Howell Memorial Trophy for Excellence. Thank you to all the staff who contributed to the BAE GAYE scheme. We were awarded £500 to help us continue with our riding in the Furness area. 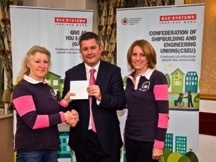 Pictured are Alex Lewis, HR Director of BAE Systems, with June Chapman, Furness RDA Riding Co-ordinator and Judith Stitt, Chair.